[Updated at 12:08 p.m.] A plane carrying Russian, German, Swedish and former NHL hockey players crashed as it took off Wednesday afternoon from Russia's Yaroslavl airport, killing at least 43 people, Russian emergency officials said. [Updated at 10:47 a.m.] An aviation agency spokesman, Sergei Izvolsky, told CNN the plane crash occurred around 4 p.m. (8 a.m. ET) during take-off because the plane couldn't reach a safe altitude fast enough. The plane carrying Russian, German and Swedish hockey players crashed as it took off from Russia's Yaroslavl airport Wednesday afternoon, killing 36 people. [Updated at 10:45 a.m.] Lokomotiv Yaroslavl had a number of players with ties to the National Hockey League, according to the NHL website. They included defensemen Karel Rachunek, Ruslan Salei and Karlis Skrastins, as well as forwards Pavol Demitra and Josef Vasicek, the NHL website said, as well the team's head coach, Brad McCrimmon, who had played and coached in the NHL. A Russian Kontinental Hockey League ice hockey match between Salavat Yulayev and Atlant was halted in the city of Ufa after news of the crash came through. [Updated at 9:58 a.m.] A plane carrying Russian, German and Swedish hockey players crashed as it took off from Russia's Yaroslavl airport Wednesday afternoon, killing 36 people, Russian news agencies reported. The Lokomotiv Yaroslavl team - which included players from Germany and Sweden - was scheduled to play a match in the new Kontinental Hockey League, RIA Novosti said. 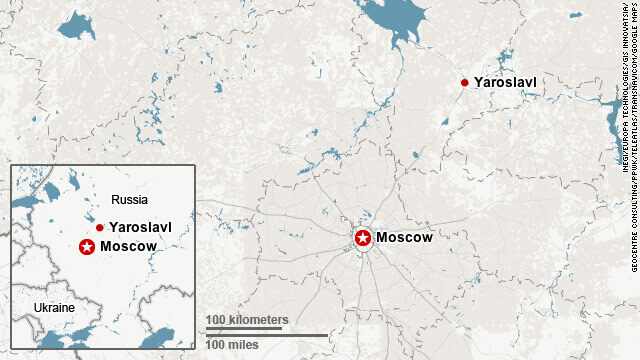 An aviation agency spokesman, Sergei Izvolsky, told CNN the crash occurred around 4 p.m. (8 a.m. ET) during take-off because the plane couldn't reach a safe altitude fast enough. [Updated at 9:25 a.m.] A Russian Emergency Situations Ministry representative said there were 37 people aboard a plane that crashed, including four crew members. Preliminary information indicates 36 died and one is missing, the ministry said. However, the Russian Federal Aviation Agency said three people had survived the crash and that their condition was critical. [Updated at 9:11 a.m.] The Yak-42 aircraft was taking members of a hockey team to Minsk, the Belarusian capital, the state-run RIA Novosti news agency reported. [Posted at 9:02 a.m.] A plane crashed as it took off from Russia's Yaroslavl airport, killing 36 people, Russian news agencies report. The Yak-42 aircraft belonged to Yak-Service Airlines, the aviation authority told Interfax news agency. Yaroslavl is located northeast of Moscow. Its shocking to know that Karlis Skrastins joined Lokomativ for this season!!! Its a huge loss for every hockey fan and especially to Latvians because we lost our real Iron Men. All condolences to the families of these hockey players. This blog style of news reporting blows. Soon it will just be a list of Tweets.